NASA and Northrop Grumman are now targeting Saturday, Oct. 6, 2018, for the launch of the agency’s Ionospheric Connection Explorer, or ICON. The spacecraft will launch aboard a Northrop Grumman Pegasus XL rocket from Cape Canaveral Air Force Station in Florida. The launch window is 90 minutes starting at 4:00 a.m. EDT and ICON will be launching off the coast of Daytona at 39,000 ft. at a heading of 105.0 degrees. The June launch was postponed after off-nominal data was detected during the ferry flight of Pegasus. The root cause was traced to a faulty sensor, which has been replaced. The United Launch Alliance Delta IV Heavy rocket carrying NASA’s Parker Solar Probe lifted off at 3:31 a.m. EDT on Sunday, Aug. 12, from Space Launch Complex 37 at Cape Canaveral Air Force Station in Florida. 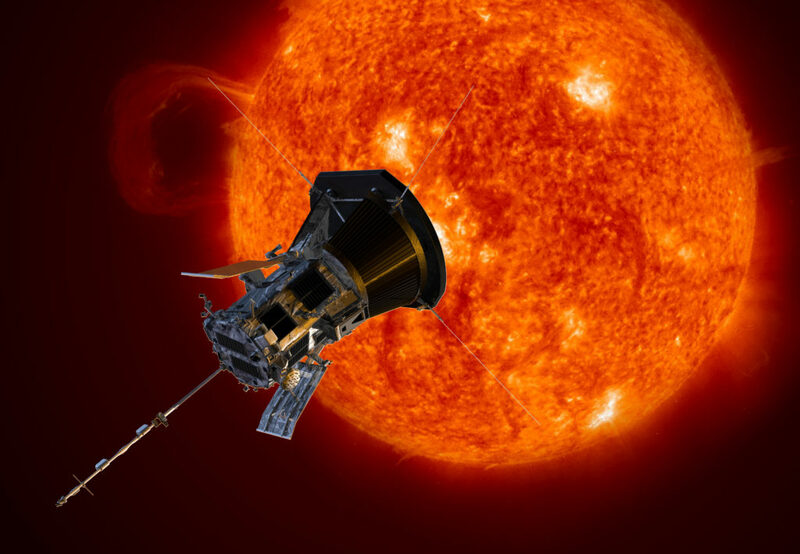 Parker Solar Probe will be the first-ever mission to “touch” the Sun. The spacecraft, about the size of a small car, will travel directly into the Sun’s atmosphere, called the corona, about 4 million miles from our star’s surface. For more on the mission, visit https://www.nasa.gov/parkersolarprobe. The launch of a United Launch Alliance Delta IV Heavy rocket carrying the Parker Solar Probe spacecraft was scrubbed today. The launch is planned for Sunday, Aug. 12 from Space Launch Complex-37 at Cape Canaveral Air Force Station. The forecast shows a 60 percent chance of favorable weather conditions for launch. 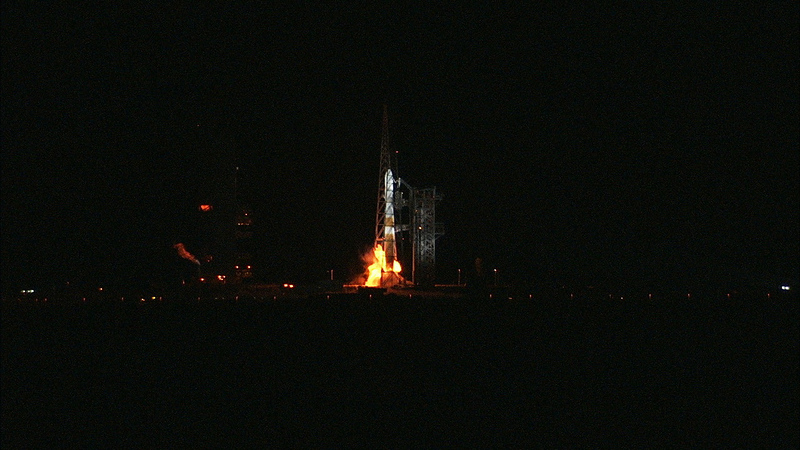 The launch time is 3:31 a.m. ET. 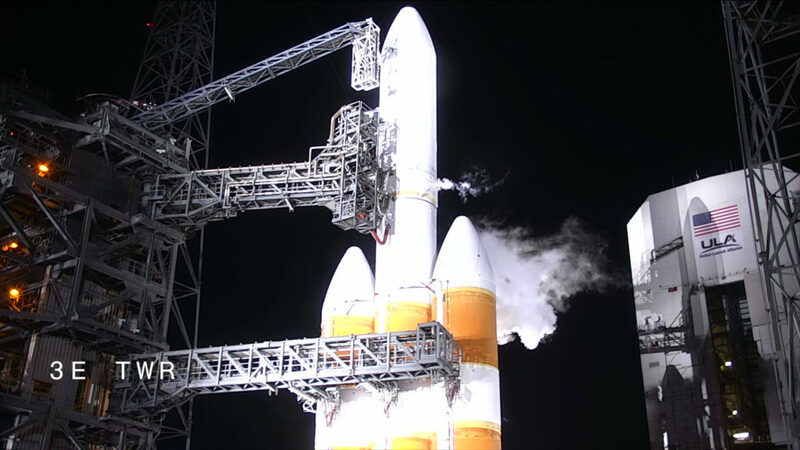 NASA’s Parker Solar Probe is scheduled to lift off atop a ULA Delta IV Heavy at 3:53 a.m. EDT, at the opening of a 65-minute window, on Saturday, Aug. 11. Live launch coverage begins at 3 a.m. on NASA TV and NASA’s Parker Solar Probe Launch Blog. For the latest status, visit www.nasa.gov/parkersolarprobe. NASA Administrator Jim Bridenstine, left, made his first official visit to the agency’s Kennedy Space Center on Monday, Aug. 6, 2018. His up-close look at the premier, multi-user spaceport began with Center Director Bob Cabana giving the administrator a helicopter tour over the bustling Florida spaceport that included the center’s Industrial Area. NASA Administrator Jim Bridenstine made his first official visit to the agency’s Kennedy Space Center on Aug. 6 and 7 for an up-close look at the premier, multi-user spaceport. 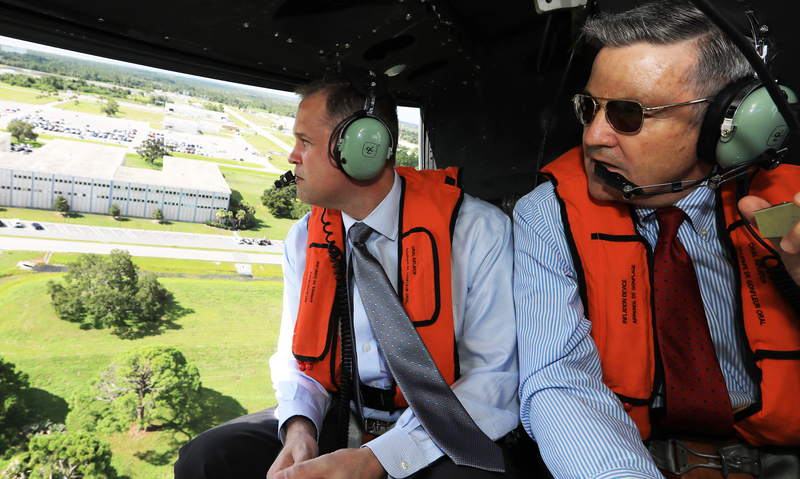 Bridenstine’s visit began with Center Director Bob Cabana giving the administrator a helicopter tour of the bustling Florida spaceport. During an all hands meeting for Bridenstine to speak with employees, Cabana commented on the spaceport’s shift. 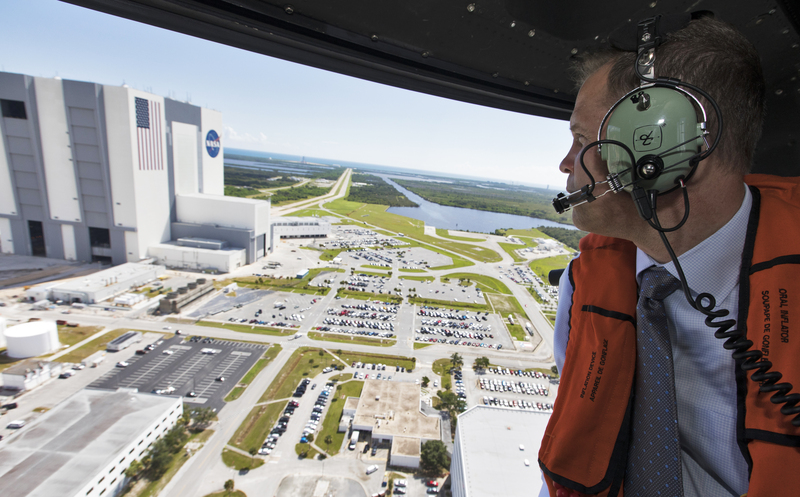 During his helicopter tour of NASA’s Kennedy Space Center, Administrator Jim Bridenstine gets an up-close view of the iconic Vehicle Assembly Building. Bridenstine also thanked Kennedy employees for their part in the recent changes. For nearly half a century, Kennedy operated as a NASA-only space center. As the Space Shuttle Program came to an end, Kennedy began preparing to support NASA’s Space Launch System (SLS) rocket and Orion spacecraft. Anticipation of an emerging commercial space industry resulted in center leadership developing an innovative concept of a multi-user spaceport to change focus from a big government, NASA-only space center to the agency partnering with other organizations. The administrator also spoke of the crucial role NASA plays in everyday life around the globe. In addition to touring Kennedy facilities, Bridenstine participated in an Industry Roundtable hosted by the Economic Development Commission of Florida’s Space Coast and Space Florida. He later met with members of the news media in the center’s Space Florida’s Space Life Sciences Lab facility. 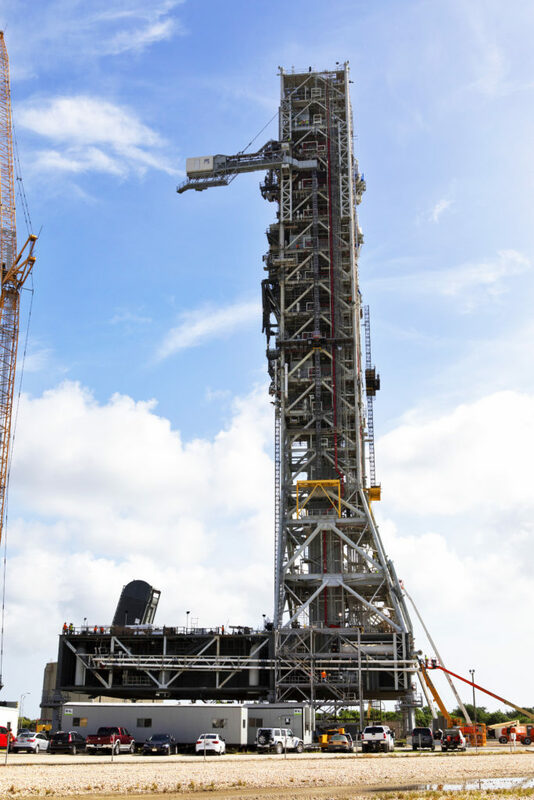 Technicians and engineers in Exploration Ground Systems at the NASA’s Kennedy Space Center in Florida recently tested the Crew Access Arm (CAA) that was added on the mobile launcher being prepared to support the agency’s Orion spacecraft and Space Launch System rocket. As astronauts prepare for trips to destinations beyond low-Earth orbit, their last steps before boarding an Orion spacecraft will be across the Crew Access Arm (CAA) on the mobile launcher. 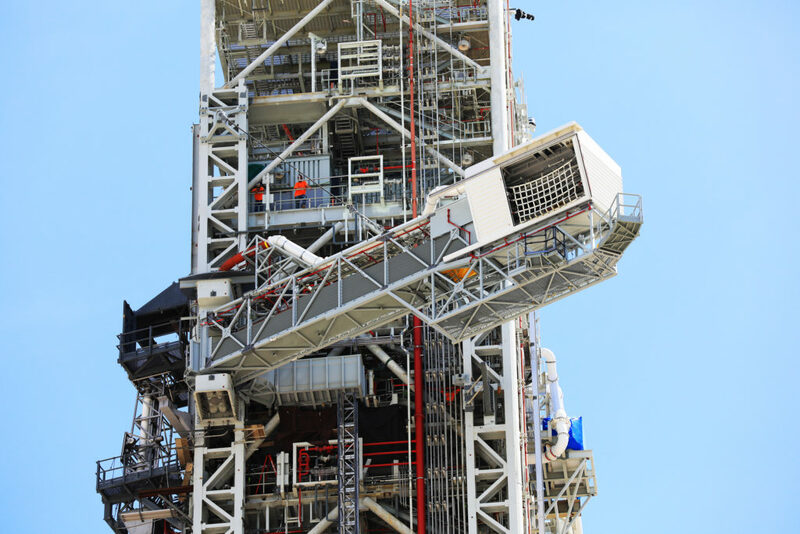 Earlier this year, the CAA was added to the mobile launcher being prepared to support NASA’s Orion spacecraft and Space Launch System (SLS) rocket, the largest in the world. Technicians and engineers in Exploration Ground Systems at the agency’s Kennedy Space Center recently tested the crucial arm, confirming it worked as designed. The test was designed to determine the functionality and integrity of the CAA and supporting mobile launcher systems. The crew access arm is located at the 274-foot level on the 380-foot-tall mobile launcher tower. The CAA will rotate from its retracted position and interface with the Space Launch System rocket at the Orion crew hatch location to provide entry in and exit from the spacecraft. The CAA is designed to rotate from its retracted position and line up with Orion’s crew hatch. The arm will provide entry and emergency egress for astronauts and technicians into and out of the Orion spacecraft. In advance of those missions, the Exploration Ground Systems team at Kennedy has been overseeing testing of umbilicals and other launch accessories on the 380-foot-tall mobile launcher in preparation for stacking the first launch of the SLS rocket with Orion. During the test, there were several moves of the arm controlled by systems on the mobile launcher. The test also was important because of the upcoming move of the mobile launcher from its park site to the Vehicle Assembly Building (VAB). Testing inside the VAB is designed to ensure all systems work properly in connection with the building prior to stacking the first SLS and Orion for Exploration Mission-1. EM-1 will be the first unpiloted flight of the new NASA spacecraft traveling 280,000 miles from Earth well beyond the Moon. The team that tested the umbilical lines and launch accessories that will connect from the mobile launcher (ML) to NASA’s Space Launch System (SLS) rocket and Orion spacecraft for Exploration Mission-1 celebrated their achievement during a banner signing at the Launch Equipment Test Facility (LETF) at the agency’s Kennedy Space Center in Florida. Engineers and technicians in the Engineering Directorate and the Exploration Ground Systems Program, along with contractor support, began the tests at the LETF about 2.5 years ago. The first to be tested was one of two aft skirt electrical umbilicals. Testing of the final umbilical, the second of two tail service mast umbilicals, was completed on June 27. 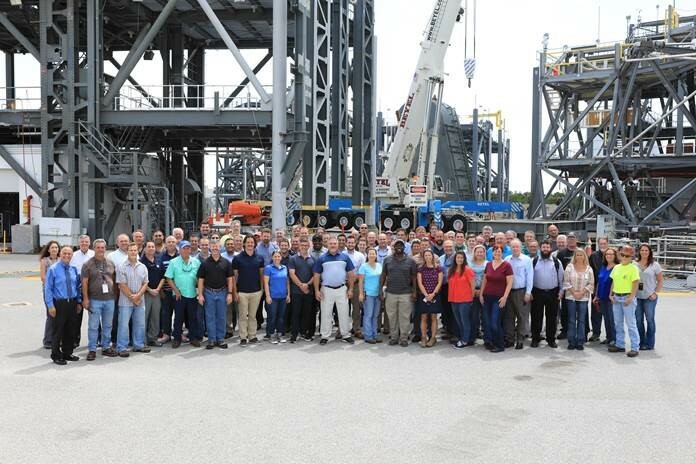 “The team of NASA test engineers and test managers, and contractor engineers and technicians, worked tirelessly six days a week, 10 hours a day, in order to meet the highly aggressive schedule and deliver the hardware to the mobile launcher for installation,” said Jeff Crisafulli, Test and Design branch chief in the Engineering Directorate. In all, 21 umbilicals and launch accessories were tested on various simulators at the LETF that mimicked conditions during launch to ensure they are functioning properly and ready for installation on the ML. Most have been delivered and installed on the ML tower. These include the Orion service module umbilical, interim cryogenic propulsion stage umbilical, core stage forward skirt umbilical and core stage inter-tank umbilical. Two aft skirt electrical umbilicals, two aft skirt purge umbilicals, a vehicle stabilizer system, eight vehicle support posts and two tail service mast umbilicals were installed on the 0-level deck of the ML. Before launch, the umbilical lines will provide power, communications, coolant and fuel to the rocket and spacecraft. Additional accessories will provide access and stabilization. During launch, each umbilical and accessory will release from its connection point, allowing the SLS and Orion to lift off safely from the launch pad. “Design, fabrication and testing of the new mobile launcher’s umbilicals and launch accessories is a once-in-a-lifetime opportunity that I am proud to have been part of,” Crisafulli said.